It was a bright winter day. The flags flapped and snapped loudly in the cold wind. People drew their wool cloaks tighter around them and adjusted their collars and hats to stay warm. All the officials were there, including the governor and his assistant, the chaplain and the commissary officer – all dressed in their finest clothes. The settlers from Fort Christina (present-day Wilmington, Delaware) gathered that day to greet two ships from Sweden, which brought new supplies, new settlers and most importantly, a new governor. At 2 p.m. on February 15, 1643, a musician sounded his trumpet, and the man everyone was waiting to see walked down the gangplank to set foot on land after three and a half months at sea. He must have been quite a sight, for Johan Printz was a mountain of a man, weighing more than 330 pounds. Queen Christina had sent Printz to take charge of the colony. And that is exactly what he did. The son of a Lutheran minister, Printz had attended seminary before making his career in the military. Before leaving for New Sweden, the Swedish Royal Council had given him detailed instructions on how to improve the colony and make it more valuable to the realm. Printz's first order of business was to secure his country's claim to the entire river valley and expand the colony. To that end, the Council instructed him to build new fortifications, remove foreign squatters and maintain friendly relations with the nearby Dutch and English. To improve the colony's economy, the officials advised him to increase trade with the nearby Lenape Indians, encourage settlers to raise tobacco, plant grapes and start a winery, manufacture salt on the sea coast, hunt whales and raise silk worms. The new governor also had religious responsibilities. He was to make sure that official Swedish Lutheran services were held regularly and to convert Indians in the colony to Christianity. To enable Printz to carry out his duties, the Royal Council gave him unlimited authority to govern. The new governor wasted no time in getting started. The day after his arrival, Printz toured the entire colony by boat. Sailing up the South River (the Delaware River) and into some of its tributaries, he scouted out several sites for new blockhouses and trading posts, picked a site for his new residence and ordered the refurbishing of the capital, Fort Christina. In the weeks that followed, he encouraged the settlers to raise tobacco by offering them a premium price for their crop and he hired a "tobacco master" to teach the Swedes how to grow, cultivate and harvest the plant and properly cure the leaves. He arranged the purchase of cattle from the Dutch at New Amsterdam, and expanded trade with the Lenape for foodstuffs and the Minquas, who lived in the Susquehanna River Valley, for beaver and other valuable furs. Between 1643 and 1644, the colony operated with great energy under Printz's direction. During his tenure as governor, Printz faced a number of serious challenges. In June 1644, only ninety men and a few women and children remained in the colony. Disease, deaths from Indian attacks and desertions had all taken their toll. To survive, the colony needed more men and women. Over the next three years, more settlers did arrive and the population practically doubled to 187 people. To protect his tiny colony from Lenape warriors and the Dutch, who were busy buying nearby land from the Lenape and setting up their own trading posts, Printz petitioned for more soldiers and more manufactured goods for the fur trade. Ships arrived from Sweden through 1648 but after that, the loss of a supply ship at sea and war with Denmark prevented the mother country from providing supplies for six years. No trade goods meant less corn and fewer furs from the Lenape and the Minquas. As the small colony struggled to survive, Printz also faced growing internal dissent and desertions as settlers deserted New Sweden for the English colonies of Maryland and Virginia and the Dutch New Netherlands. On July 27, 1653, twenty-one settlers presented Printz with a petition in which they described him as cruel, and accused him of exceeding his powers as governor. 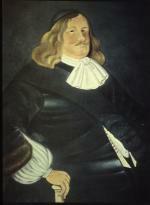 Outraged at what he considered a mutiny, Printz arrested the suspected ringleader of the group, Anders Jonsson, put him on trial, found him guilty of plotting rebellion and on August 1, 1653 executed him by hanging. When the complaints against him continued, Printz sent his resignation to his superiors in Sweden. In October 1653, he left the colony with his wife, four of his daughters, and all of their personal belongings on a ship bound for New Amsterdam. There, ten years after he had first arrived in North America, Johan Printz arranged passage on a Dutch ship back to Sweden. Stellen Dahlgren and Hans Norman, The Rise and Fall of New Sweden (Uppsala, Sweden: Almqvist & Wiksell), 1988.